On the 12th of February 2010 I was on the beach at Thurstaston with a fellow colour ring fanatic looking for colour ringed Knot. A few hundred came in close enough for inspection. We got one. Red ring on the right tibia, a yellow ring with a tab on it (known as a "flag") with the inscribed letters A P A on the left tibia. This individulally marked bird had been caught and colour ringed in Porsanger, Norway on 25th May 2008. 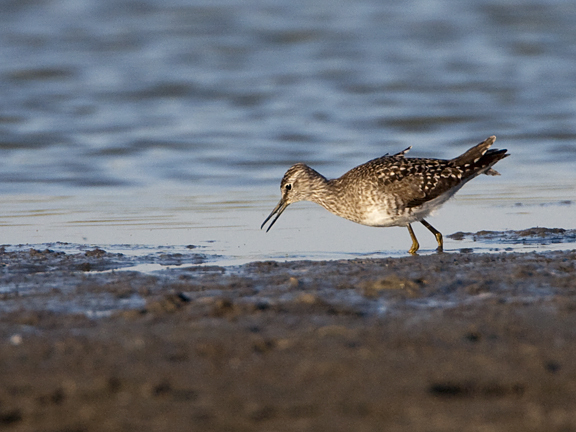 As part of the Islandica sub-species of Red Knot it had hatched in northern Greenland or north east Canada. The birds migrate through Norway to the Wadden Sea before some spread out west and reach us on the Dee where they spend the winter. They then return north in Spring. Amazing. We note the colour and letters ready to send all the details of our sighting to the scientists running the research/ringing project. On the 27th November 2010 we are back on Thurstaston Shore, in almost the same spot looking for more colour ringed waders. A few hundred Knot come in close enough for inspection. We get one. We are stunned. The same bird we saw in the same spot 288 days previous. Migration is a wonder of our natural world. I cannot help but be awe-struck at the feats of these tiny birds. Fast forward to 2011. May 3rd to be excat. I had been looking on Birdguides at the latest sightings across the country. Turning off species and county filters can be quite interesting. 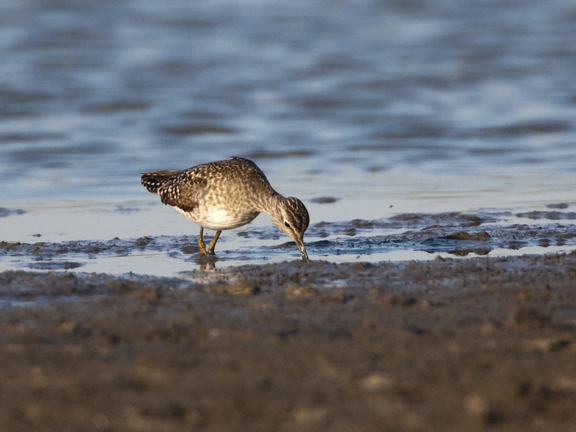 I had seen reports pop up of Wood Sands close by. 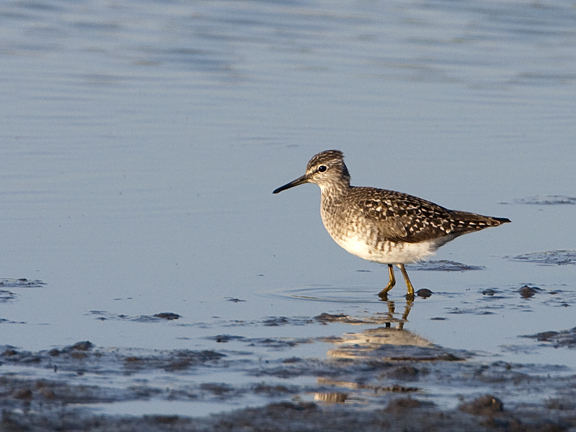 One at Moore Nature Reserve, one at Conwy and several others further afield. Obviously they are starting to pass through Briltain in good numbers. I think to myself "I wonder if we'll get one at Gilroy?" 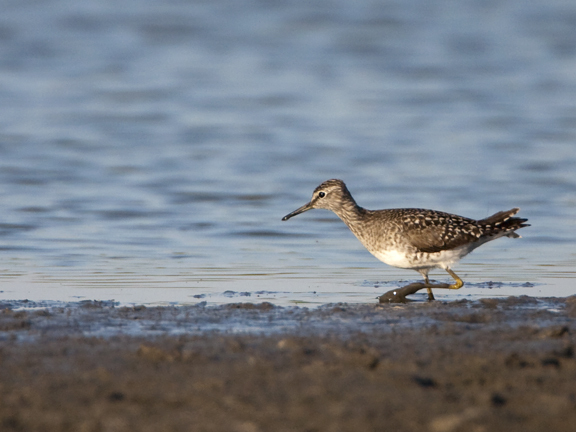 I get a text telling me there is a Wood Sandpiper at Gilroy. Magic, the Patch never lets me down! Now it's here I want to see it so I pack the kit, saddle up on the Super Deluxe and start the short cycle ride to the reserve. 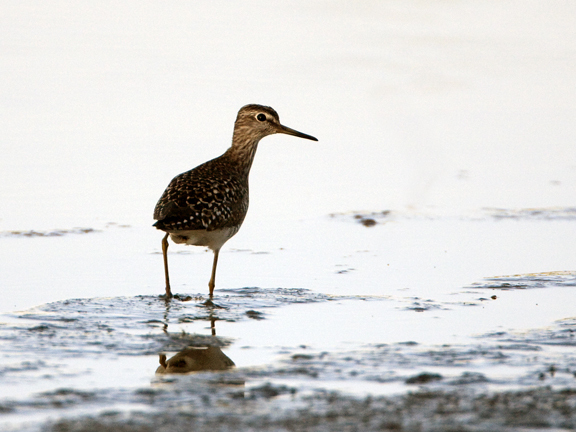 On the way I start to wonder if it could be the same Wood Sandpiper that visited us last August. I grew quite fond of it, the bird stayed for a few days and I was up there loads looking for colour ringed Black-tailed Godwits among the 800 strong flock that uses the flooded field at the end of summer, so I saw it a lot. In a moment of daftness I even named the little rascal Spruce Wingsteam. For the reasons behind this stupid name see the post from last August. I arrive and Spruce is still there. He is quite distant. On the other side of the pool, skittering around the muddy edge of the water. The pool has dried up considerably since my last visit. The muddy margins give way to dried and cracked earth before the grass starts. He starts to walk a little closer. He looks weighed down by the mud that clings to his feet and lower legs. Obviously hungry there is a lot of probing in the soft waterlogged mud for food. I settle in and watch. I'm not going to add him to my year list, take a record shot and leave, I'm going to stay and watch for a bit. I'm a birdwatcher, not a bird collector (not that there is anything wrong with these two activities - they are just a bit too fast paced for me!). The idea that this is the same bird is a little far fetched, but the story that I told at the top of this post is lingering in my brain and I can't ignore it. That story is not a one off either. Colour ringed Godwit YG - GRflag dropped in at Gilroy on the 5th October 2009. It only stayed for a day. 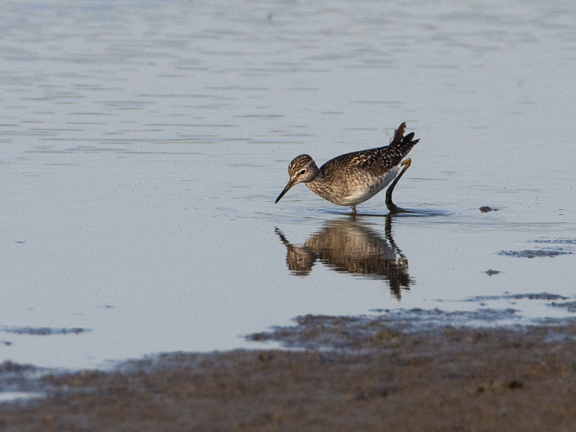 On the 31st August 2010 the same bird dropped in at Gilroy again, on the same flooded field. It stayed for a day. So there is a chance, albeit a remote one that I am watching Spruce. I hope it is. I don't know why I got so attached to this bird, perhaps it is knowing a little about the long and perilous journey it is undertaking, perhaps it was the near miss it had with a Sparrowhawk last August, maybe I'm just getting soft! It is an endearing little thing, and I am very much enjoying watching it bobble about the pool in front of me. The last of the suns rays are hitting me on the back, warming me through. A feeling of contentment settles over me. More photos, I decide. I reel off plenty of pictures as Spruce reels in plenty of grubs. Soon it is time to leave, the sun is slipping behind the trees bordering the new allotments and my belly is rumbling. I know it might not have been him, and I know he didn't come to see me - I am not that naive or self obsessed, but it made for a good evenings bird watching. I wish him well as I hop on the bike and head home. He's seen briefly next morning, but is not relocated. Up and away to the marshlands of Scandinavia or Russia.